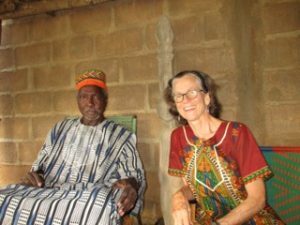 The American Association of University Women and The League of Women Voters Tanana Valley invite you to learn about experiences of two Fairbankans helping to empower women in a West African culture. Peace Corps volunteer, Marilyn Russell, and dissertation researcher, Joy Morrison, both spent time in Burkina Faso, West Africa. Russell in 2013-15 and Morrison in 1988-89. They are both feminists who focused on strengthening rights of Burkinabé women and on family/health issues, and gender equity. Russell served in the US Peace Corps and Morrison was with the Academy of Education Development. They will share their experiences in West Africa with an interactive presentation with slides, materials and discussion. This entry was posted in Uncategorized on November 8, 2017 by gbmurakami.